MELBOURNE, Florida -- The Brevard County Sheriff’s Office West Precinct General Crimes Unit is seeking assistance in identifying a burglary suspect captured on surveillance camera. 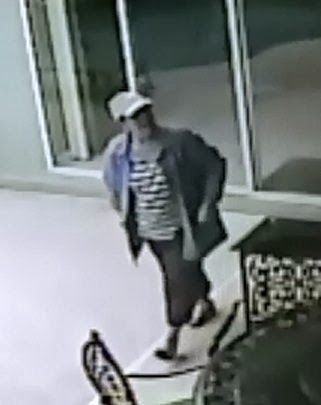 On Tuesday, November 26, 2013 at approximately 11:00 a.m., a woman seen in the surveillance photos entered a residence located on Davidia Drive in the Windover Farms area of Melbourne, Florida. The woman can be seen using a pry tool to attempt to gain entry through a sliding glass door, then later is seen inside the residence having gained entry through another door. She exits the residence through the front door, and leaves the area in the vehicle shown. The suspect vehicle is described as a late model blue or green small SUV. The vehicle may have a dark colored stripe down both sides. The suspect is described as a middle-aged female, appearing to be white or Hispanic. She is described as being approximately 4’-11” to 5’-01” tall and weighing between 150 and 200 pounds. 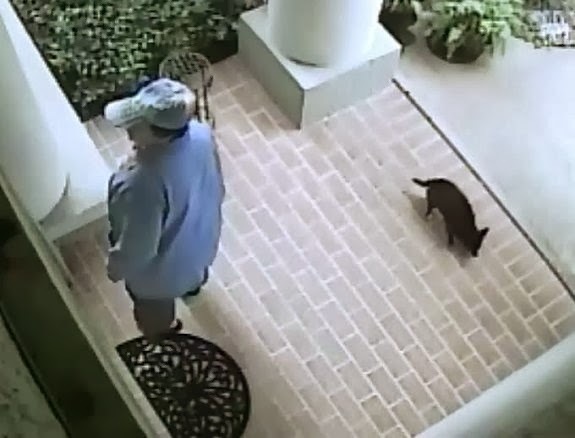 The suspect brought her dog with her, and the dog can be seen on the surveillance photos. Anyone with information concerning the identification of this suspect is asked to call the Brevard County Sheriff’s Office West General Crimes Unit at 321-617-7306 or CRIMELINE at 1-800- TIPS (8477). All calls to CRIMELINE are confidential, and callers can remain anonymous and be eligible for a reward of up to $1000.00 for information leading to an arrest. If anyone has information that would help to identify this person, please contact Agent Todd Holland from the Brevard County Sheriff’s General Crimes Unit at 321-617-7306.